Good day to you all, fellow DisNerds! 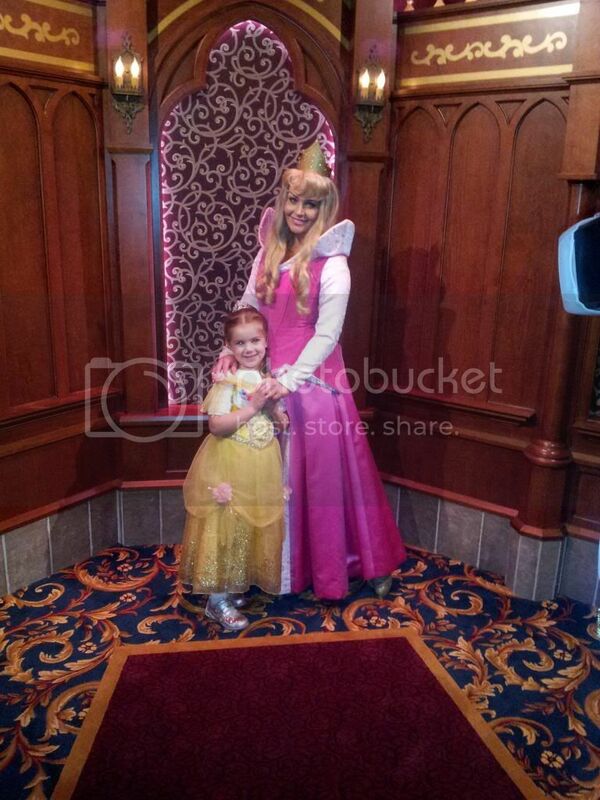 Ready for some princesses? Would you like a Boysen-Apple Freeze and a show to go with them? 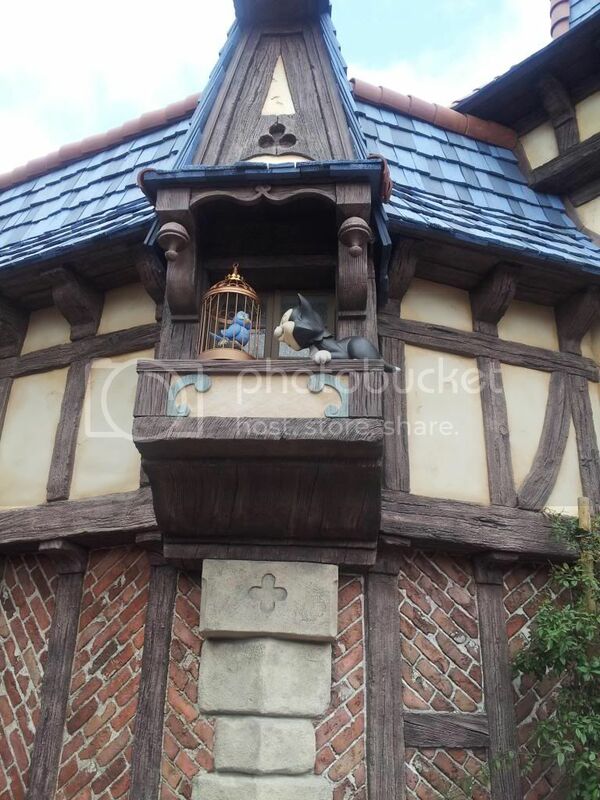 Fantasy Faire, the new expansion of Fantasyland at Disneyland that takes over Carnation Gardens, opens March 12th. 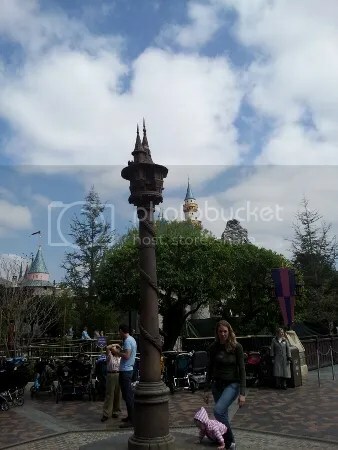 Living out of state, I’m not able to be at the parks whenever a new area opens up. Fortunately, on my last trip to the Happiest Place on Earth, I was able to preview the area with my family. I know there are lots of pictures floating around at this point. However, I wanted to share from my perspective: a parent, seeing it through the eyes of his little girl. From that point of disbelief on, all she could keep saying was, “Best..Surprise…EVER!! !” And well, seeing her eyes light up at everything from the shows to the scenery to the meet and greets…I couldn’t disagree. As follows, here are some of the pictures I took with my cell phone (Please forgive the fuzziness in a few) with observations of the area. 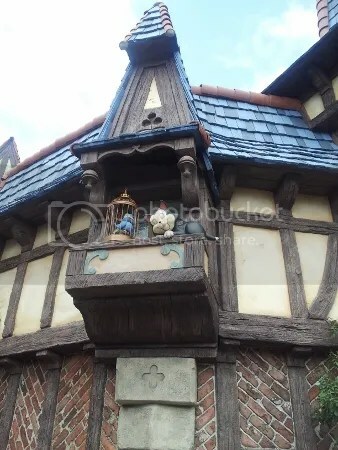 The village itself has some great detail. It definitely has a wonderful Fantasyland feel. Imagineers should be proud! The first thing we did as we arrived was head over to the Royal Theatre, where the Tangled performance was about to begin. 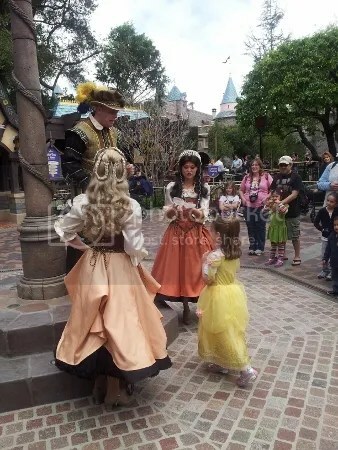 Now, for any parent who has visited the old Princess Fantasy Faire and seen a coronation ceremony or storytelling time, you understand the idea that I wasn’t going in with high expectations. I mean, the presentations were cute for kids, and it’s fun to watch the little ones dance, but that’s about it. So to say the shows here exceeded my expectations was an understatement. The shows, told by “Mr. Jones and Mr. Smythe” with help from the lead characters, are extremely entertaining. Told with humor and music, I heard as many adults laughing as children. If you don’t have children to take for the meet and greet area, still make time to see the shows here. You won’t regret it. 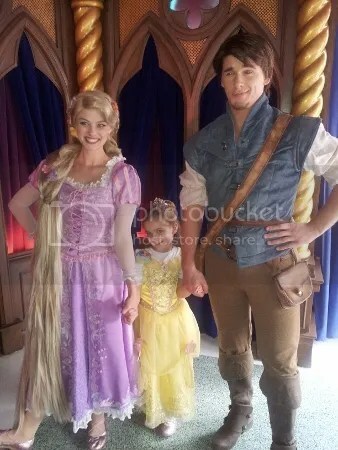 Afterward, we got to meet Rapunzel and Flynn! Charming as always, this was a plus for the children in attendance. Great to see these kinds of interactions – boys and girls alike were getting into it! After this little impromptu gathering, we headed toward the Royal Hall (the meet and greet area). 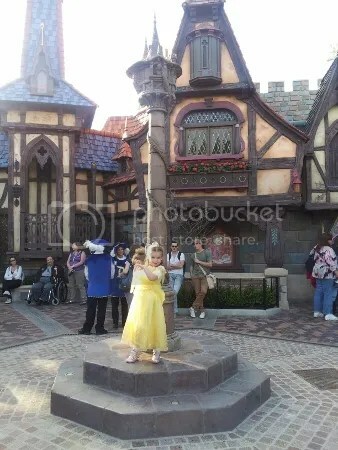 The princesses in attendance that day were Cinderella, Ariel and Aurora (this may be par for the course, as Snow White is set to make appearances by her wishing well and other princesses in their appropriately themed lands). Although I’ve included only one picture of the area, you can see just how intricate and elegant the meeting area is! Upon exiting, it’s time to leave, right? 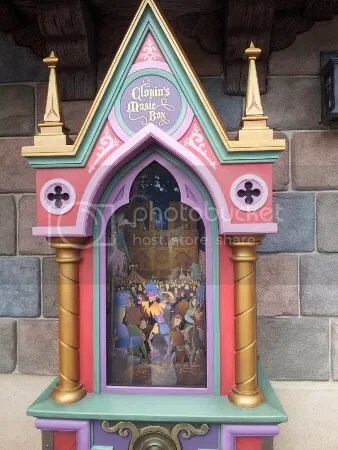 Clopin’s Music Box is a fun little interactive element where visitors turn the wheel to set things into motion, with music and moving features. 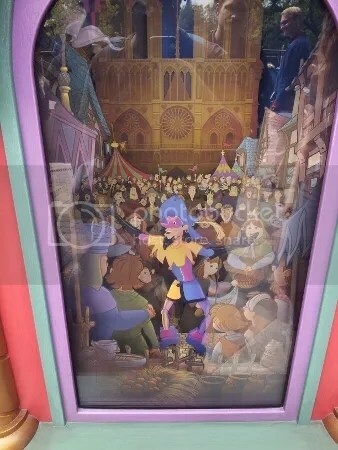 Make sure you look closely at all of the characters in the far background – see how many Disney characters you can spot! Remember to click on the link for a bigger picture to see better! Everything was nice and peaceful…. Until his little feathered friend wakes him up. Time for a snack! Maurice’s sells a few different twists, including cheddar garlic, strawberry, and chocolate. But the real highlight here is the Boysen-Apple (Get it? POISON Apple?) Freeze. Quite sweet and refreshing on a warm day, this is bound to be a hit! It’s a great drink for kids and adults alike, and those in my party preferred this over Red’s Apple Freeze from the Cozy Cones in Cars Land. 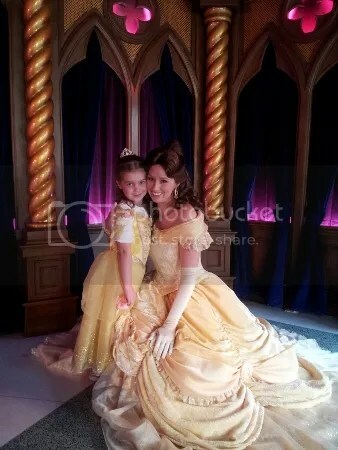 We were able to come back later to catch the Beauty and the Beast Show in the Royal Theatre. Once again, it was very entertaining for audiences of all ages and included a meet and greet with Belle afterward. 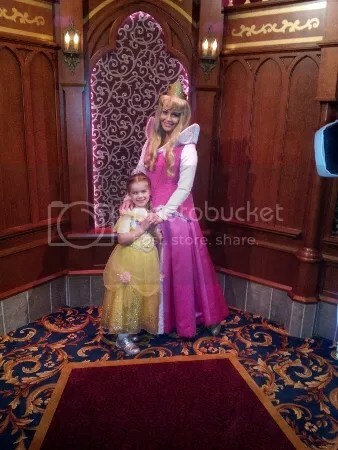 My princess with the Disney variety – they have the same tailor! 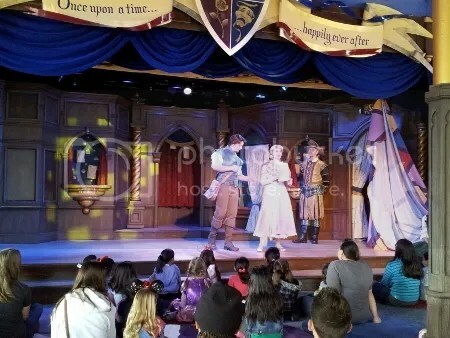 As all good things must come to an end, so did our time in the new Fantasy Faire. However, it’s safe to say, we’ll be back. This area will remain popular for a long time for families and many grown ups as well. 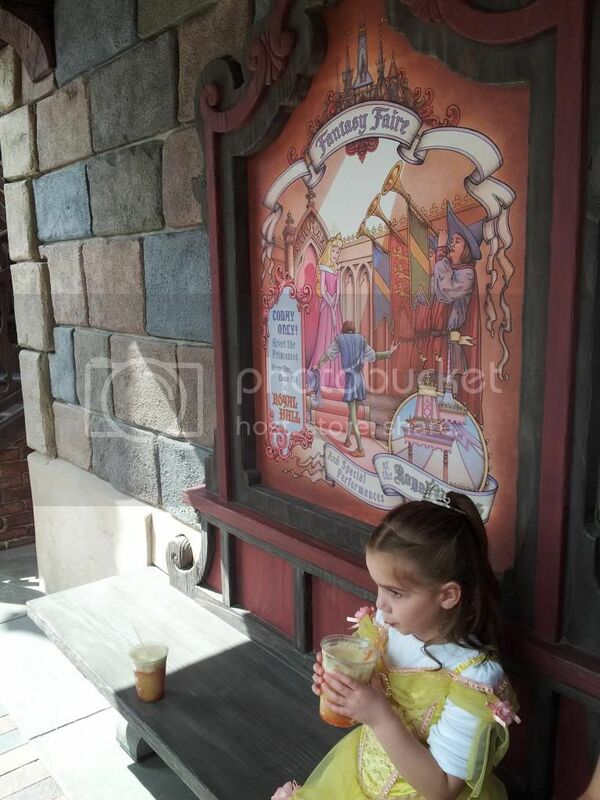 Perhaps I’m skewed as a parent who got to see the joy on his daughter’s face, but I have a hard time finding flaw with any aspect of this area. From the shows to interactions, food to detail, Disney once again has another area to be truly proud of. One last shot to share… as I went to attempt a picture of Rapunzel’s tower with Sleeping Beauty Castle in the background, a friend stopped by in the clouds to say hello…. See ya real soon, Fantasy Faire! That’s it for now, folks! 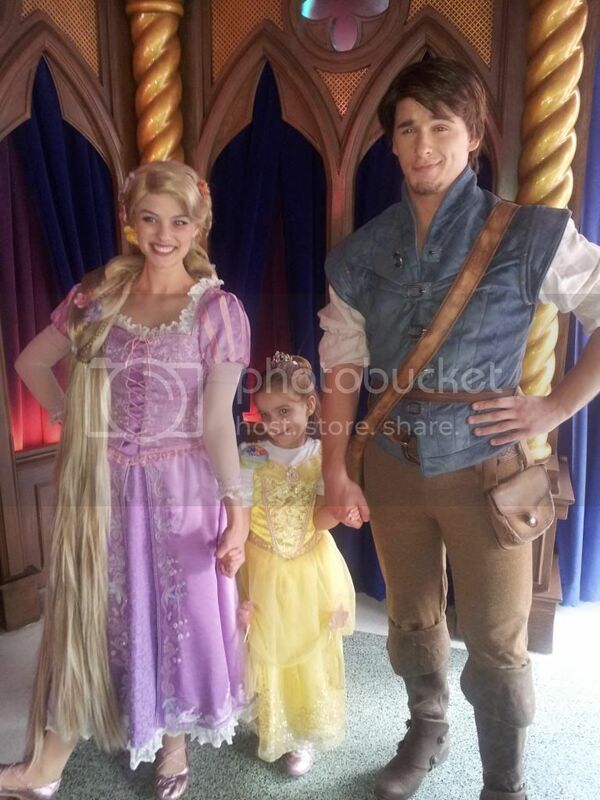 A special thanks to Austen over at Disney Park Secrets for making this day possible for a friend and his family!